This most attractive disc shows yet again that Hummel's vein of contemplative virtuosity ran deep. At seven he became Mozart's pupil, later studying composition with Salieri and organ with Haydn, absorbed the influence of Beethoven and came to be himself the object of admiration from a succeeding generation. The works recorded here are well chosen to show Hummel's gifts as lyricist, quasi-improvisator, virtuoso and composer of the highest quality. A portentous semi-improvised theme opens the op 49 Caprice; with operatic flourishes and novel ornamentation the work exploits dynamic gradients and dance rhythms to splendid effect. 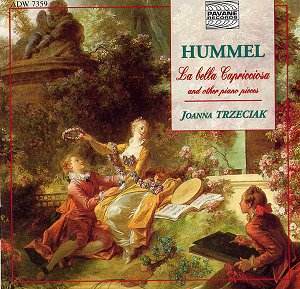 Hummel's obviously virtuosic talents were invariably compatible with a lyrico-contemplative impulse and toward the end of the piece <sample 1> we can hear his reflective telescoped recapitulation of the earlier adagio section that then gallops through to the coda at the top end of the treble. The Gluck variations are a surpassingly clever set which exploits subtle rhythmic changes and differing registers. These, fused with imitative passages and colouristic playfulness, lend a riotously eventful air to a piece that, even here, evinces a yet subtler character. There is in Hummel a foreshadowing of Chopin or, more generally, a kind of Proto-Romanticism that is almost unsettlingly attractive <sample 2> and it runs throughout his music, though most particularly his solo piano music. The three Bagatelles played here are uneven in quality but strong on character. The first, a Scherzo, is brisk and classically imitative in Hummel's best style whilst the fifth is nobly contrapuntal and somewhat attractively aloof. It is the third, however, La Comptemplazione, that is the greatest of them and one of the highlights of the disc. Its a richly chromatic and searchingly romantic piece with layered decorative passagework and moments of remarkable expressivity <sample 3>. Haydnesque in its thematic points of reference it is a really beautiful piece in its own right and deserves a place centrally in the repertoire. He was always far more than a virtuoso. LAutrichienne thrives on graciously rolled chords and is a sly and winningly humorous stylised Viennese waltz. The contrastive folk section fills out the texture nicely. The op 11 Rondo is one work of Hummel's that gained currency amongst pianists and was something of a staple for players of the Golden Age. Humorous and conversational it makes for sparkling playing. The Polonaises long line is evidence of Hummel's lyrical gifts and the storm tossed Beethovenian episode contrasts nicely with the pensive minor key section. Throughout the Cracow born pianist Joanna Trzeciak brings real insight, feasting on the folk and Polish dance rhythms elegantly embedded into the syntax of the music. Her phrasing is good, ornaments apposite and her rubato sparing. Maybe her runs in the Polonaise could be more fearless; I also felt that the fifth Bagatelle would go better at a fractionally faster tempo. The sound itself is somewhat clangourous and not of ideal clarity but hardly enough to withhold recommendation to a disc that should win Hummel friends, and admirers.